No Fixed Address is a rare treat as a travelogue, managing to be thoughtful, hilarious, and inspiring all at once. 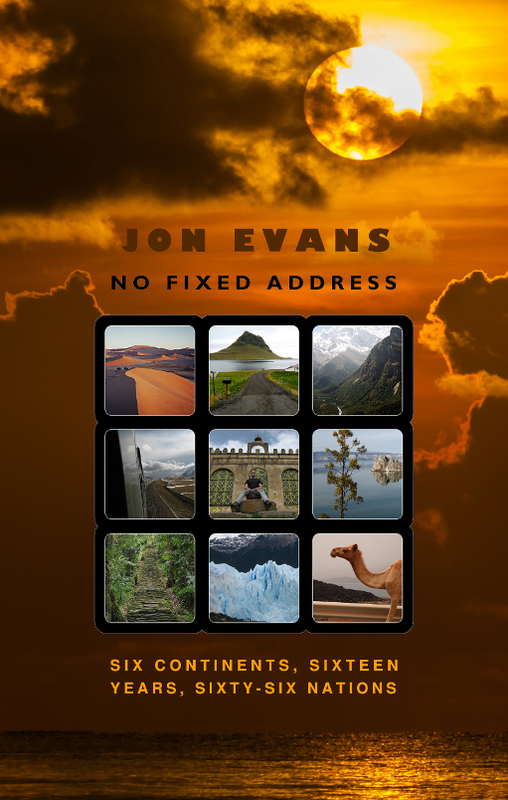 Ricocheting across continents in Jon Evans’s No Fixed Address, a collection of his travel notes, is both an exhilarating and a revealing experience. Global insights are packaged with panache, and a spirit of adventure comes through the text, whether its intrepid traveler finds himself in rewarding new locales or wrestling with mishaps. The book is divided into global regions, with Evans hitting all areas save Antarctica—he’s daring, sure, but never that divested of creature comforts. He careens across Africa first, lauding the beauty of its sub-Saharan nations and weaving in lessons on how the continent moved from colonialism into modernity. The text is wont to half-apologize for these incredibly engaging mini-histories, but should not: its insights thrill. Such historical narratives are strongest during Evans’s travels through Zimbabwe, a nation to which his family has connections. He both names colonial exploitations and critiques the officials who shook off outsiders for the ways in which they failed to hold extant economies together. So, too, does he marvel at landscapes, always with a sense of their regional rootedness: Victoria Falls may have become so because of outsiders, but in the text it is described in local terms, as Mosi-oa-Tunya, ‘the smoke that thunders.’ Such awareness makes the text all the more illuminating; here is a visitor who honors the places he lands holistically. From the spectacle that is Burning Man to troubled Haiti, sights, sounds, and legal stimulants are all afforded due appreciation. Even places that appeal to travelers’ spirits as a rule sound newly intriguing here. The greatest treasure of the book, though—beyond the sheer mileage that it covers and its ability to weave between very settled places and very remote ones—is its narrator’s voice, which teems with good humor and unapologetic nerdiness. Tolkien references come more than once before smoking volcanoes, and a spider bite in a cave is remarked upon with the hope that the offender was radioactive. Evans chides himself for enjoying banana shakes on beaches too much, writes a satirical side essay as a coddled Western visitor who never experiences places far beyond the hotel, and sneaks into a seven-star UAE hotel just to comment upon its over-the-top golden ceilings and surprisingly delectable, $100+ hot and sour soup. They say that from the top of Mount Wilhelm, on a clear day, you can see both the north and south coasts of Papua New Guinea. I cannot confirm this, but I can tell you that, weather permitting, you may see a lot of clouds. Those who travel to guidebook places when he does, but only for photos, are remarked upon with amusement and some pity, of which the text reserves only a small measure for itself when naming the places that its own author misses. You can’t see it all, as Evans self-quotes. So much is certain in the text, and yet it treats the places that it does touch down in with such respect, bemusement, and hunger that it’s impossible to end without feeling the bite of the travel bug—radioactive or not—yourself. No Fixed Address is a rare treat as a travelogue, managing to be thoughtful, hilarious, and inspiring all at once. Born and raised in Waterloo, Ontario, Jon Evans is the son of a Rhodesian expatriate father and a tenth-generation Canadian mother. 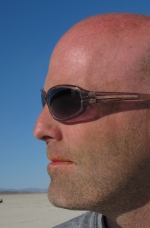 He studied Electrical & Computer Engineering at the University of Waterloo, graduated in 1996, and promptly moved to California to work in the burgeoning software industry. Evans spent the next fourteen years working, writing, and travelling far and wide around the globe before finally returning to Canada in 2010 -- for now. Evans is the author of four thrillers, one graphic novel, and one dark urban fantasy, and his journalism has been published in Wired, The Guardian, Reader’s Digest and The Globe and Mail. His first novel, Dark Places, won the 2005 Arthur Ellis Award for Best First Novel. Evans currently lives in Toronto and at www.rezendi.com.